1) Distribute GBS Brochures and Materials – Please click here to order/download our GBS brochures and other materials to distribute in your community or workplace. Our website banner is also available from our download page if your workplace would like to create GBS awareness on their website as well. ​2) Contact Newspaper Articles/TV News Reports – Call the health editor of your local newspaper and/or news station to tell them your GBS story. Contact GBSI if you need contact info for a provider in your area who is proactive in GBS prevention as reporters also usually include information from a medical professional. Don’t forget to send a link to the news coverage of your story to GBSI! 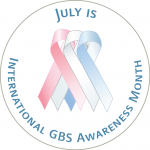 3) Make GBS Awareness Ribbons for GBSI– Awareness ribbons are needed on an ongoing basis to fill our orders. They are fun to make with a group of friends and family and great for public interest stories in your local paper. Please visit our GBS Awareness Ribbons Page for illustrated directions and suggestions as to where to purchase materials. 4) Write Letters-to-the-Editor – Tell your story and emphasize that all pregnant women should be informed about group B strep and how to help protect their babies throughout pregnancy and early infancy. 5) Pregnancy Boards/Blogs/Websites for Women’s Health – Contribute accurate GBS information to these sources for women’s health information and post links to GBSI’s resources. 6) Request Website Links to GBSI! – Copy and paste our request to link to our website and email it to your local health departments, medical providers, and women’s health websites. 7) GBS Awareness Month Proclamation in Your City – Although July is recognized on the US National Health Observance Calendar as International Group B Strep Awareness Month, it’s important that it be recognized on the community level as well. Please call your local city hall to find out their procedures. 8) Organize a fundraiser! Click here for ideas on what to do. 9) Contact GBSI at info@gbs-intl.org with your successes to inspire other parents and providers!